﻿Dedicated training is something to be admired. Many athletes strive for the ability to get up and get out every single day whether it’s for a specific race or event or even, simply driven by a goal. Often that can mean adhering to a training plan based on both repetition and incrementally increased difficulty–monotony and overuse be damned. Turns out, I’m not alone. Up to 56% of recreational runners experience injuries, with most of those relating to the knee. Supplements can help (like glucosamine, which promotes the development of cartilage), but up to 75% of those are overuse injuries. A study of 27 male runners were assigned one of three different resistance training regimens (in addition to their normal endurance training): heavy resistance, explosive resistance or muscle endurance training. In all three groups, running endurance performance increased.2 The heavy-lifting group, in particular, saw improvements to high-intensity running characteristics, like sprinting at the end of the race. Muscle protein synthesis can increase by as much as 50% in the hours after a workout, helping encourage muscle growth. Concurrently, muscle fibers are rebuilt. These processes are a normal part of the exercise, and recovery allows the muscles to become stronger. Fluid restoration is also key, as it helps deliver nutrients to organs and muscles through the bloodstream. And acids (via that hydrogen proton associated with lactate) accumulate during workouts–so recovery provides time for the body to restore intramuscular pH and blood flow for oxygen delivery. Supplementing recovery may help expedite that process and get you back in the saddle faster. HVMN Ketone has been shown to improve recovery by decreasing the breakdown of intramuscular glycogen and protein during exercise (when compared to carbs alone). It also expedited the resynthesis of glycogen by 60% and protein by 2x when added to a normal post-workout carb or protein nutrition. Doing the same exercise can be mentally exhausting, leading to mental fatigue that wears down on your desire to even do the workout. Research has shown that the mind is usually a good gauge of the body, with a mental strain reported by a questionnaire being closely related to stress signals in the hormones of the body. By switching it up with cross-training, and also ensuring rest days, the mind will get a chance to recharge too. A great whole body workout, swimming is one of the low-impact exercises most often used for recovery or cross training. Interestingly, reports show many people enjoy water-based exercise more than land-based exercise. Swimming works the whole body; it increases heart rate without the joint-pounding stress of running, it builds endurance and can also build and tone muscle. Because of these benefits, it’s a great option for recovery–a study showed that patients with osteoarthritis showed reduced stiffness, joint pain, and overall less physical limitation. It also torches calories. Swimming has shown improved body weight and body fat distribution when compared to walking. An average person can burn almost 450 calories when swimming at a low or moderate pace for one hour. At an increased pace, that could go north of 700 calories. For comparison, running for one hour at a leisurely pace burns about 400 calories. Outside of the aerobic benefits, swimming (and water training, like deep-water running) has shown to improve cardiovascular health and lung capacity. A systematic review analyzed the benefits of cycling, showcasing a myriad of results. There was a positive relationship between cycling and cardiorespiratory fitness, cardiovascular fitness, and general fitness. Whether on the road, the track, or in the gym on a stationary bike, the benefits of cycling as a cross-training mechanism stem from the fact it’s a low impact, muscle building, aerobic workout. It can help athletes train if they have experienced an injury. Many endurance athletes don’t consider strength training as part of their workout routine, but it can help prevent injury while improving strength for your main sport. For runners, maybe that’s improved core strength for economy. For cyclists, maybe the outcome is a higher power output. Regardless of your sport, strength training is imperative to improving endurance for runners and cyclists. In a study of postmenopausal women, high-intensity strength training exercises showed preserved bone density while improving muscle mass, strength and balance. It can also help prevent injury. In a study of soccer players who strength trained in the offseason, hamstring strains were lower (and that group also saw increases in strength and speed). The mental benefits of resistance training have also been documented; studies have shown it improves anxiety and depression. A good strength training regimen will focus separately on different muscle groups. There are several options for lifters of all different levels, but starting with some simple bodyweight exercises (like push-ups or pull-ups) can allow you to build toward free weight training, weight machines, or rubber tubing. A meta-analysis of periodized training–varying your strength training workouts–has shown results for greater changes in strength, motor performance and lean body mass. So don’t get stuck doing the same routine over and over again. A good way to push yourself is to incorporate overload training into some of that strength work. Yoga can improve performance by targeting specific aspects of flexibility and balance–one study, which took place over the course of 10 weeks in male collegiate athletes, saw improvements in both balance and flexibility. In older adults, studies have shown improved balance and mobility. Strength is also a target of many yoga programs, especially in the core. Even a study in which a specific pose (sun salutation) was used six days per week for 24 weeks, participants saw increased upper body strength, weight loss and endurance. But with yoga, the body is only half the game. It has been shown to decrease cortisol levels (the stress hormone), along with the ability to lower levels of depression, stress, and anxiety. There have even been studies which showed overall quality of life improvements in seniors. Maybe part of these mental benefits are linked to better sleep quality. One study illustrated that a group participating in yoga fell asleep faster, slept longer and felt more well-rested in the morning. Yoga isn’t an aerobic workout, but it stretches muscles, builds strength and has been shown to improve mood. Because its low-impact, yoga can be done every day. Typically gyms or studios have beginner classes, and they will typically last between 60 and 90 minutes. Athletes can use yoga as recovery days, so between one and three sessions per week would be perfect. Hiking, for example, is a great way to build strength and get outside during a recovery day. Same goes with exercises like kayaking or stand-up paddle boarding – these can help build upper body strength while encouraging an athlete to get out of their comfort zone (literally, and figuratively). We wouldn’t recommend team sports because there’s a risk of injury. But tennis might be an exception. While there are of course injury concerns with every sport and exercise, tennis has shown to improve aerobic fitness, lower body fat percentage, reduce risk for developing cardiovascular disease and improve bone health. With exercises backed by science. Be first to know when we release our training guide about running cadence. 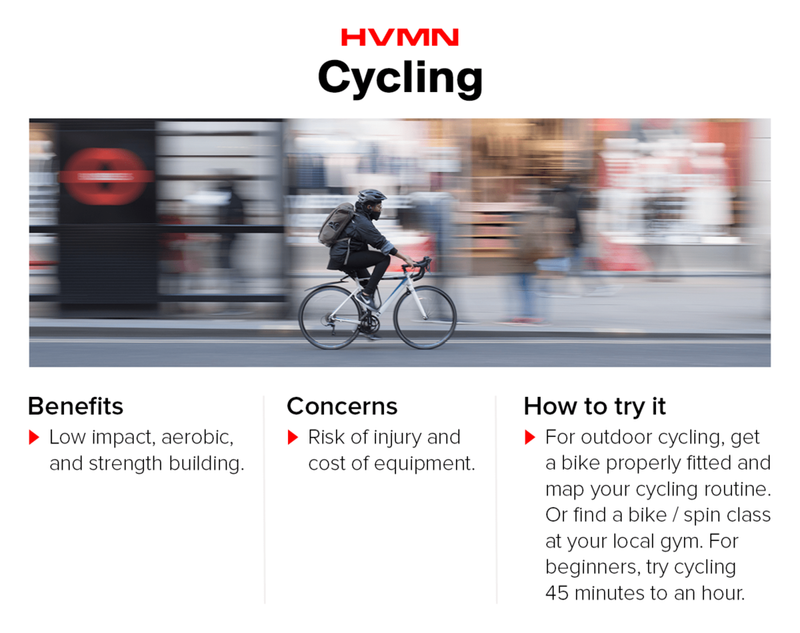 Visit us at HVMN.com to learn more about Human Enhancement and performance.